Thomas Friedman and Michael Mandelbaum’s new book, That Used to Be Us, looks at the America that used to be – the one that built the tallest buildings, constantly developed “the next big thing,” and grew the world’s most successful economy – and compares it with America now – the one that takes six months to repair simple subway escalators in Washington, D.C., while China builds the 2.5-million-square-foot Meijiang Convention Center in eight months. Universal education that is effective enough to train our people to make use of technology. Investment in infrastructure to keep us connected and productive. Immigration policies that continue to attract highly motivated, competent talent from other countries. Federal funding for research and development. Regulatory policies that promote responsible capital formation and deployment. Friedman noted that it’s only natural that other countries will begin to experience prosperity as they become more viable economies. It shouldn’t threaten us that others start to rise in position. We should be concerned, however, if we start to sink from levels we have achieved, and signs are that we are doing so. We face four major challenges, Friedman says – how to adapt to globalization, how to adjust to the IT revolution, how to cope with the budget deficit, and how to manage the rise in energy consumption while dealing with climate threats. He chides the baby boomer generation, indicating that our parents were believers in “save and invest” while we’ve lived our lives by the principle of “borrow and spend.” His is a voice calling for sacrifice, which is never a popular cause. He urges us to opt for greater discipline and to take the measures needed to correct the course we’re on. We can choose to have one hard decade and eventually rebound, or we can choose not to do so and face a very bad century. Friedman sounds an optimistic note, however. If we recommit to the principles that made us great, we can still do extremely well. What do you think? How can we change course? 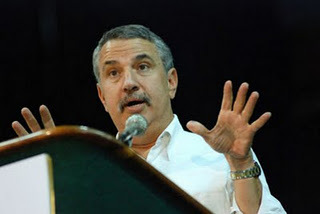 This entry was posted in Leadership, Politics, Society and tagged America, challenges, prosperity, Thomas Friedman. Bookmark the permalink. Thanks for the recommendation Pete. I added it to my library queue.